Freedom Youth Project Foundation will be presenting Liars and Posers to approximately 600 middle school youth at Matthey Middle School on Thursday, June 5, 2014. The presentation will be an hour long informational session on human trafficking. The presentation will cover need to know prevention strategies and will teach youth how to recognize deception tactics used by traffickers. Freedom Youth Project Foundation is excited to announce that we have been selected to present as part of the 2014 Texas CASA Conference! The conference will take place October 23-25, 2014 and will be held in Galveston, Texas. 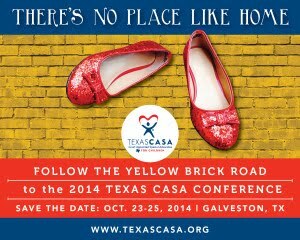 "This year’s Texas CASA Conference is heading to Moody Gardens in Galveston. Join more than 600 CASA volunteers, staff and board members from the 71 statewide CASA programs for three days of workshops and speakers presenting their expertise and personal experiences in the child welfare system to help advocates enhance their skills to better serve abused and neglected children in foster care." Freedom Youth Project Foundation will be presenting Liars and Posers to the middle and high school youth at Baptist Temple SA on June 1, 2014. The presentation will cover prevention strategies and will teach youth how to recognize deception tactics used by traffickers. Tomi Grover of TraffickStop will also be presenting on the issues of human trafficking and will discuss what can be done to help make a difference. "Baptist Temple began as a mission in the home of Mrs. Elkins on Rusk Street. It was organized in 1911 and built its first worship center in 1914 on the corner of Denver and St. Anthony. In 1927 Baptist Temple moved to its current location at Gevers and Drexel. Over the years new buildings have been constructed and remodeling has continued. One thing remains the same and that is the commitment of Baptist Temple to reach out to its community with the love of Jesus Christ." SAAS will be hosting a meeting May 20, 2014 from 7-8:30pm at the Oblate School of Theology located on 285 Oblate Drive in Room 100. The speaker of the meeting will be Debra Jordan. "Debra works with a program to help former prostitutes get services and the leave that life. She is a 25-year veteran of the Sheriff's Office, a former Deputy Chief with Bexar County, a Master Jailer, and Master Peace Officer. SAAS meetings are free and open to the public." UPDATE: Liars and Posers training at OLLU does not yet have a firm schedule date: Attention Youth Leaders and Pastors: OLLU and Freedom Youth Project Foundation will be presenting Liars and Posers to middle and high school students. The goal is to teach youth the importance of safety and why being safe is one of the most valuable assets they can carry with them throughout their life. College students will teach youth how to protect themselves, how to be smart about the choices they make and ultimately how to defend themselves against a predator who may be trying to target them. Freedom-U will be inaugurated on February 27, 2014 at 6:00pm with an event at Our Lady of the Lake University. The goal of Freedom-U is to engage university and college students in the movement to end the trafficking of children and young people in this country. This event will provide attendees with knowledge, skills and tools to become advocates for their younger peers who are at highest risk from the deceptions used to lure victims into the world of human trafficking. Freedom-U Pre-Planning Event will be held January 13, 2014 at Our Lady of the Lake University. At this event, we will be introducing what Freedom-U is and why college students would benefit greatly from it. Those who are attending will have a role in shaping the Freedom-U Event on February 27. At Freedom Youth Project Foundation, we work with human trafficking task forces, law enforcement and local agencies and we want to be able to create opportunities for students to meet and interact with these agencies to help them learn about future careers. Think Freedom Campaign will be hosting Think Freedom Children's Charity Motorcycle Ride on November 23, 2013 from 10am-5pm at Caliente Harley-Davidson in San Antonio, TX. It is a community wide event aimed at raising funds to go towards Public Awareness, Prevention, and Restoration of Youth. It is a family friendly event filled with music, food, and prizes. Freedom Youth Project Foundation will be presenting as part of the League of Women Voters Panel on Human Trafficking at the Downtown Central Library On November 21, 2013 at 6pm. Freedom Youth Project will discuss the ways in which traffickers target youth and runaways and red flags that parents and teachers need to look for when it comes to the safety of their child. "The League of Women Voters is a nonpartisan political organization encouraging informed and active participation in government. It influences public policy through education and advocacy." Freedom Youth Project Foundation will be attending St. Mary Magdalen Church's Respect Life Mass & For Life Fair on October 5, 2013. This Mass will be presented by the Archbishop Gustavo Garcia-Siller at 8:00am. Immediately after Mass in the Parish Hall, join us for food and fellowship as we learn about what it means to truly live out the culture of life from the womb to the tomb.